We can help others regardless of our age. Captain Caveman is thousands of years old; he doesn’t let that stop him from lending a hand, though, and neither do the Teen Angels. What’s more important than one’s age is their ability and willingness to help. Overeating can be a dangerous thing. Cavey can swallow some pretty big things, which sometimes gets him into trouble. He’s apt to gobble up some important items without even realizing it. No job is too tough if you’ve got the right tools. Whenever the group is in a pinch, Cavey always seems to be able to produce just the right tool for the job. Whether from his club, or out of his hair, he’s got just what the doctor ordered. If you dig down deep enough, you can solve any problem. As we mentioned, Cavey’s got a crazy knack for pulling things from deep inside his substantially furry exterior in order to help the girls solve a case. He shows us that there’s value inside each of us. Language barriers need not keep people apart. Captain Caveman doesn’t have the best command of the English language; but that doesn’t prevent him from successfully teaming up with the Teen Angels to solve a tough mystery. He is accepted by the group, and works through his disadvantage. Failing on occasion doesn’t make you a failure. For all of Cavey’s strengths and resourcefulness, his powers do sometimes fail him, or he eats something he shouldn’t. In the end, he’s still a hero to the Angels, and a vital part of the team. It’s OK to be different; you can still fit in. As far apart in looks and background as they are, Captain Caveman and the Teen Angels are a friendly, caring group of friends as well as an effective team of crime-solvers. They don’t let their differences affect how they work together or how they feel about each other. Looks aren’t everything. You might suppose that someone who looks like Captain Caveman wouldn’t be much good at helping solve a mystery. It would be easy enough to write him off as just another hairy caveman. He proves that looks don’t matter, and even uses his to his advantage. We should never let things weigh us down. Cavey’s club allows him to fly; but soaring high in the sky is difficult to do, and doesn’t last very long, when you’re carrying a heavy load. 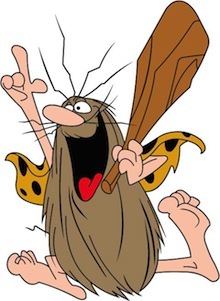 Captain Caveman has so many things stuck in his hair, it’s a wonder he ever gets off the ground. We can be that way too, weighed down by some things we carry around inside us. Even a caveman can be a gentleman. Cavey is a strong, powerful guy who was never taught manners the way we are as children. Still, he knows how to behave around girls, and never uses his strength or powers to bully anyone, or be abusive. Cavey only uses those powers for doing good and protecting the Teen Angels.